No one knows for sure exactly when the first strawberry shortcake was made. What we do know is that shortcake has been around at least since Shakespeare. It was mentioned in his play, The Merry Wives of Windsor. 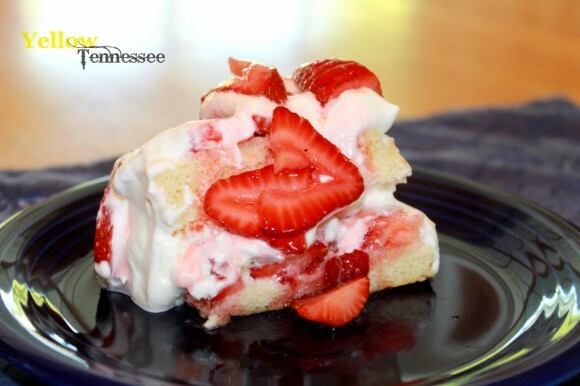 In honor of this iconic dessert, June 14th is national Strawberry Shortcake Day. And I for one think that sounds like a day I need to participate in. 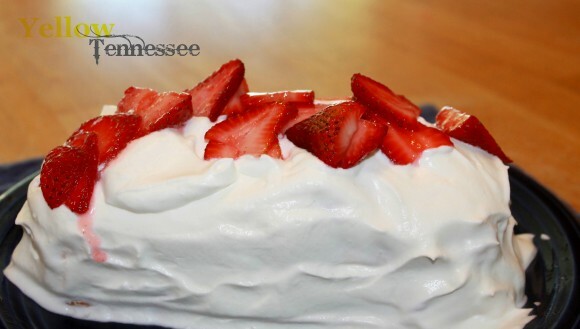 We are huge fans of strawberry shortcake here. It is my husband’s all time favorite dessert and I have always said that it tastes like summer in a bowl to me. So when Driscoll’s offered to send me some coupons so I could come up with a new twist on this classic dessert I had a few ideas on what to try. Originally I was going to go with a more traditional ice box cake but most of those recipes call for cookies instead of actual cake. Then this idea struck. This is a little labor intensive as each part is made from scratch, but the end result is so worth it. 6 eggs, separated yolks from whites. 1/4 teaspoon cream of tarter. Place your egg yolks in a bowl and add 2/3 cup of the sugar. Beat on high until the yolks become fluffy and a lighter color. Sift flour, salt, and baking powder into the egg yolks and gently fold in. Add vanilla, water and lemon zest and fold into the mix. Add egg whites to a bowl and beat on high until the mixer leaves trails in the whites. Slowly add cream of tarter and beat until blended. Then add the sugar and continue to beat on high until peaks start to form. Gently add the egg whites to your batter and fold in. Careful not to overmix. Bake at 350 degrees for 20 to 28 minutes. I used a 8×11 inch glass pan. Once finished, transfer the pan to a wire rack and allow to cool complete. Cut one pound of strawberries into slices and add 1/4 cup sugar. Cover and store in the refrigerator. Add whipping cream to a bowl and beat on high until the mixer starts to leave trails in the cream. Slowly add the powered sugar and continue to beat until sort peaks form. Transfer to the fridge until ready to use. Cut your sponge cake in half down the middle. Then cut one side in half lengthways. This will make 4 equal pieces of cake. 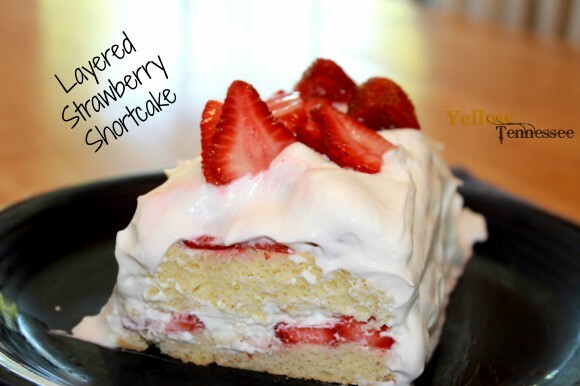 Place on layer of the cake on a plate and top with a layer of the sliced strawberries. Top the strawberries with some of the whipped cream. 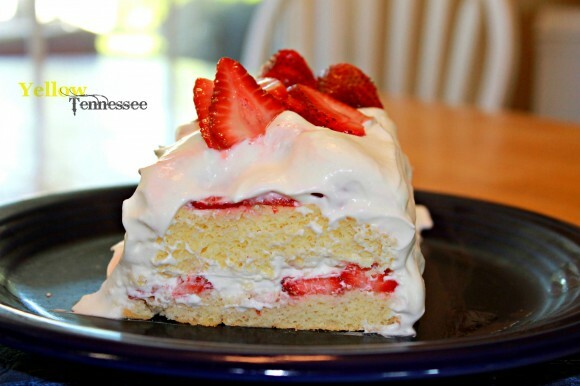 Add another layer of cake and strawberries on top of that layer. Then cover the entire thing with whipped cream. Save the remaining strawberries to garnish the top before serving. Place the cake in the freezer for 20 to 30 minutes. Then transfer to the fridge and keep cold until serving. My husband likes his shortcake with lots and lots of juice from the berries. So just before serving I added a few more sliced strawberries and the juice. We loved this and I will be making it again very soon!